Experts from NYU Stern School of Business analyze new financial regulations and what they mean for the economy The NYU Stern School of Business is one of the top business schools in the world thanks to the leading academics, researchers, and provocative thinkers who call it home. In Regulating Wall Street: The New Architecture of Global Finance, an impressive group of the Stern school s top authorities on finance combine their expertise in capital markets, risk management, banking, and derivatives to assess the strengths and weaknesses of new regulations in response to the recent global financial crisis. * Summarizes key issues that regulatory reform should address * Evaluates the key components of regulatory reform * Provides analysis of how the reforms will affect financial firms and markets, as well as the real economy The U.S. Congress is on track to complete the most significant changes in financial regulation since the 1930s. Regulating Wall Street: The New Architecture of Global Finance discusses the impact these news laws will have on the U.S. and global financial architecture. T he Dodd-Frank Wall Street Reform and Consumer Protection Act of 2010 is everywhere described as the most ambitious and far-reaching overhaul of financial regulation since the 1930s. The Act was born of the severe financial crisis of 2007-2009 and the Great Recession that followed. It attempts to fix parts of the financial architecture that failed in the crisis. The Act is already being denounced by some for not going far enough to curb the risky behavior of financial institutions, and condemned by others for going too far and hampering innovation and efficiency in financial markets. Following Restoring Financial Stability: How to Repair a Failed System, a forensic analysis of the financial crisis of 2007-2009, forty NYU Stern faculty have produced this in-depth analysis of the Dodd-Frank Act. It provides a comprehensive description of the important parts of the Act and a balanced assessment of its likely success as the new regulatory architecture for the financial system. The Dodd-Frank Act, together with other regulatory reforms introduced by the Securities and Exchange Commission (SEC), the Federal Reserve, and other regulators as well as financial sector reforms being put in place in Europe, is going to alter the structure of financial markets in profound ways. The editors argue that the Dodd-Frank Act provides much-needed improvements in financial regulation but falls far short of what could have been achieved. Today, it seems that everyone's taking credit for predicting the near collapse of America's financial system that started in 2007. But, rather than looking to the past at what went wrong and who was right, in Regulating Wall Street: The Dodd-Frank Act and the New Architecture of Global Finance, leading academics from New York University's Stern School of Business--each a specialist in a relevant discipline--turn their attentions to the new legislation to regulate Wall Street in the future, and whether the resulting regulations will promote growth and prevent another near collapse of our financial system, or contribute to its catastrophic failure. Edited by Viral Acharya, Thomas Cooley, Matthew Richardson, and Ingo Walter, this book is essential reading for policymakers, business executives, and anyone who can benefit from having a clear, coherent, and rigorous framework for thinking about the future of global finance. The Dodd-Frank Wall Street Reform and Consumer Protection Act of 2010 is everywhere described as the most ambitious and far-reaching overhaul of financial regulation since the 1930s. The Act was born of the severe financial crisis of 2007-2009 and the Great Recession that followed. It attempts to fix parts of the financial architecture that failed in the crisis. The Act is already being denounced by some for not going far enough to curb the risky behavior of financial institutions, and condemned by others for going too far and hampering innovation and efficiency in financial markets. Foreword. Preface. PROLOGUE: A BIRD'S-EYE VIEW. The Dodd-Frank Wall Street Reform and Consumer Protection Act (Viral V. Acharya, Thomas Cooley, Matthew Richardson, Richard Sylla, and Ingo Walter). PART ONE: Financial Architecture. CHAPTER 1: The Architecture of Financial Regulation (Thomas Cooley and Ingo Walter). CHAPTER 2: The Power of Central Banks and the Future of the Federal Reserve System (Thomas Cooley, Kermit Schoenholtz, George David Smith, Richard Sylla, and Paul Wachtel). CHAPTER 3: Consumer Finance Protection (Thomas Cooley, Xavier Gabaix, Samuel Lee, Thomas Mertens, Vicki Morwitz, Shelle Santana, Anjolein Schmeits, Stijn Van Nieuwerburgh, and Robert Whitelaw). PART TWO: Systemic Risk. CHAPTER 4: Measuring Systemic Risk (Viral V. Acharya, Christian Brownlees, Robert Engle, Farhang Farazmand, and Matthew Richardson). CHAPTER 5: Taxing Systemic Risk (Viral V. Acharya, Lasse Pedersen, Thomas Philippon, and Matthew Richardson). CHAPTER 6: Capital, Contingent Capital, and Liquidity Requirements (Viral V. Acharya, Nirupama Kulkarni, and Matthew Richardson). CHAPTER 7: Large Banks and the Volcker Rule (Matthew Richardson, Roy C. Smith, and Ingo Walter). CHAPTER 8: Resolution Authority (Viral V. Acharya, Barry Adler, Matthew Richardson, and Nouriel Roubini). CHAPTER 9: Systemic Risk and the Regulation of Insurance Companies (Viral V. Acharya, John Biggs, Hanh Le, Matthew Richardson, and Stephen Ryan). PART THREE: Shadow Banking. CHAPTER 10: Money Market Funds: How to Avoid Breaking the Buck (Marcin Kacperczyk and Philipp Schnabl). CHAPTER 11: The Repurchase Agreement (Repo) Market (Viral V. Acharya and T. Sabri Oncu). CHAPTER 12: Hedge Funds, Mutual Funds, and ETFs (Stephen Brown, Anthony Lynch, and Antti Petajisto). CHAPTER 13: Regulating OTC Derivatives (Viral V. Acharya, Or Shachar, and Marti Subrahmanyam0. PART FOUR: Credit Markets. CHAPTER 14: The Government-Sponsored Enterprises (Viral V. Acharya, T. Sabri Oncu, Matthew Richardson, Stijn Van Nieuwerburgh, and Lawrence J. White). CHAPTER 15: Regulation of Rating Agencies (Edward I. Altman, T. Sabri Oncu, Matthew Richardson, Anjolein Schmeits, and Lawrence J. White). CHAPTER 16: Securitization Reform (Matthew Richardson, Joshua Ronen, and Marti Subrahmanyam). PART FIVE: Corporate Control. CHAPTER 17: Reforming Compensation and Corporate Governance (Jennifer Carpenter, Thomas Cooley, and Ingo Walter). CHAPTER 18: Accounting and Financial Reform (Joshua Ronen and Stephen Ryan). Epilogue. About the Authors. About the Blog. Index. "A fascinating, lively, and thoroughly readable guide to the Dodd-Frank Act that pierces the cloud of confusion that hangs over so much of the financial reform debate. It is extremely timely and valuable, and should be required reading for all policymakers, investors, and students of finance. What makes the book so valuable is that it not only analyzes the scope of the Act, in a punchy, lively style, but it also discusses its potential impact. More important, the book analyzes what is not covered in the Act--and where the potential challenges to the financial system still lie." "The crisis of 2008 confronted even well-educated Americans with a flood of incomprehensible financial vocabulary, describing novel financial institutions and practices most of us had never heard of before. Now we have the 2,300-page Dodd-Frank Act, designed to provide the needed repair. Will it do so? What else will it do? How can we even start to think about these basic questions? 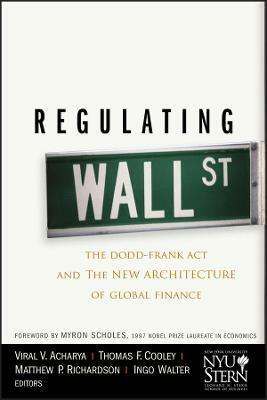 Regulating Wall Street addresses these questions in a clear, direct style, taking us through the many parts of the Act one at a time, and providing informed, cogent economic analysis of each. A valuable standard source for future discussion." "Take the faculty of one of the best finance departments in the world. Ask them to analyze the new U.S. legislation on financial regulation, and to think about what the new law gets right, what it gets wrong, and how it is likely to shape the future of the financial system. With a bit of luck, you get this very impressive book. An absolute must-read." "Regulating Wall Street goes a long way toward clarifying the intent of the various provisions of the Dodd-Frank Act and evaluating both its effectiveness and limitations. The need for effective implementation by agencies is appropriately emphasized. Not a quick read, a useful reference work on an enormously complex piece of legislation, dealing with an even more complex financial reality." "There are many villains in the story of the recent crisis and much written to name them, describe them and even curse them. . . If you want to know how to fix the problem, I highly recommend 'Regulating Wall Street,' from New York University's Stern School of Business. . . In the excellent book, 'Regulating Wall Street,' several of the studies indicate that there are few synergies among financial activities that could lead to economies of scope. The studies also demonstrate that multiple functions in large, complex firms can actually increase systemic risk. Moreover, they suggest that the spun-off activities could thrive without explicit or implied government support. The conclusion in this book is that separating activities in this manner, together with stronger resolution processes and better capital standards, would do much to strengthen our financial system, making it more accountable and stronger." "If you want to know how to fix the problem, I highly recommend Regulating Wall Street, from New York University's Stern School of Business." Viral V. Acharya is Professor of Finance at New York University Stern School of Business. Thomas F. Cooley is Dean Emeritus and the Paganelli-Bull Professor of Economics at New York University Stern School of Business, as well as a Professor of Economics in the NYU Faculty of Arts and Science. Matthew P. Richardson is the Charles E. Simon Professor of Applied Financial Economics at New York University Stern School of Business. Ingo Walter is the Seymour Milstein Professor of Finance, Corporate Governance and Ethics and Vice Dean of Faculty at New York University Stern School of Business.